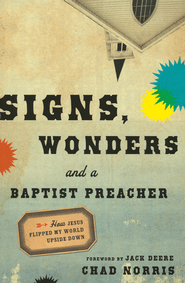 Signs, Wonders , and a Baptist Preacher is the latest book that I’ve received from Chosen Books for reviewing. The book tells Chad’s story and struggles, as he starts off from a typical conservative viewpoint… and finds himself more and more wanting to see things like Jesus did in this world. As he asks, the more things begin happening. The book seems to aim to convince the reader from a more conservative background that seeing supernatural really is possible. He tries to ease into this gently, openly admitting at times that these are things he normally would have thought of as crazy. Towards the end of the book, he does get a bit more into the hows… with encouragement to try praying for someone and see what happens. Chad’s story is interesting to read, and it’s good to see that God can always use even anxious and normal people in big ways and supernatural things.